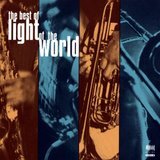 U.K. funk band Light of the World has the distinctions of having a tight head shot of a pre-stardom Sade on their self-titled debut LP cover and having guitarist Jean Paul "Bluey" Maunick as a band member. Maunick went on to lead '90s funk-jazz band Incognito. Formed in London in 1978, Light of the World included Maunick, drummer Everton McCalla, bassist Paul "Tubs" Williams, guitarist Neville "Breeze" McKreith, percussionist Chris Etienne, keyboardist Peter Hinds trumpet player Kenny Wellington and on sax David "Baps" Baptiste. The band's moniker was inspired by the title of Kool and the Gang's 1974 DeLite album Light of Worlds, which included "Summer Madness" and "Higher Plane." Signing with Ensign Records, the band had dancefloor hits with "Swingin'," "Midnight Groovin'," and "London Town." Etienne died while the band was on a promotional tour for their first album. A 12" single "Time" [Remix] b/w "London Town" was reissued by U.K. label Old Gold. Nigel Martinez, Gee Bello, and Nat Augustin joined Light of the World just in time for the release of their second LP, Round Trip, produced by Augie Johnson of Side Effect (disco hit cover of Ronnie Laws' "Always There," number 56 R&B, summer 1976). The band split up in 1981. Baptiste, Wellington, and McKreith formed Beggar & Co., and Maunick, Hinds, and Williams formed Incognito. In 1982, EMI released a Light of the World album, Check Us Out, that featured Bello, Tubbs, and Augustin, and the singles "Famous Face" b/w "Get on Board," "Ride the Love Train" b/w "Get on Board," and "I Can't Stop" b/w "Check Us Out." In 1998, EMI issued a limited edition vinyl pressing of the Check Us Out album. In the '80s, Wellington played with Wham! ("Wake Me Up Before You Go-Go"). Peter Hinds became a successful producer with hits by Scottish pop-soul trio the Chimes ("1-2-3," "Heaven") on Columbia Records, and plays keys on Incognito's albums (1991's Inside Life, 1992's Tribes, Vibes and Scribes, 1994's Positivity, 1995's 100° and Rising, 1996's Beneath the Surface), Maysa's self-titled 1995 album and Inner Shade's 4 Corners, released on N2K Encoded Music in April of 1999. Gee Bello released an '80s solo album on Capitol produced by Jonah Ellis (The Gap Band, Yarbrough and Peoples) that included the single "International Lover," and in the '90s sang vocals on CDs by the jazz-funk band Shakatak. "Are You Ready (For Love)," a track from Nigel Martinez's album So Good, is on the 1999 compilation Jazz Steppin' from Instinct Records.